Helping home cooks to eat more sustainably. Some things like chocolate brownies and Tom Hanks movies are always decent. Sure, occasionally they are amazing but even at their worst, they’re still pretty good. I thought that was the case with mojitos but lately, I’ve tasted some great ones and some disappointing ones. They run the gamut from refreshing and pleasantly tart, to syrupy with essence of Aquafresh Extreme Clean. Probably better to shoot for the former. The limes and rum are of course the key players here and this is the first time I’ve spent a lot of time researching the best of both. The Sarasota farmers market has had local key limes the past few weeks. They are beautiful to look at and their tartness is somehow more interesting than that of regular limes. And the bottled stuff? Well, that’s not even in the same league as these guys. Speaking of bottles, I started seeing bottles of rum from Drum Circle Distilling behind the bars at nicer restaurants. I picked up a bottle of the Siesta Key White rum for this recipe but I’m looking forward to tasting the gold one soon. It’s very clean tasting and was refreshing chilled on its own. It could only be made better with some fresh mint and key lime. Last year, I posted a Cucumber Spritzer cocktail recipe in the middle of cucumber season. (It’s here if you have some cucumbers around.) Letting your farmers market findings guide your cocktail recipes is quite fun and the fresh mint that I’ve been seeing here lately has opened up lots of possibilities. And mint is one of those items that should sell itself at the market. Not only is it nice to look at, but the aroma of truly fresh mint coming from a farmer’s table is enough of a sales pitch and not one found very often at the supermarket. The mixing is not difficult to do and of course the recipe can be adjusted to taste based on your guests’ preferences. I would advise though making a bit more than you think you need. 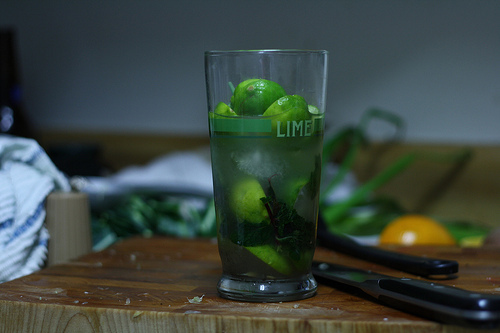 Most people say they like mojitos but what they mean is that they love mojitos. That’s all well and good but make sure you pick up some extra key limes so you don’t disappoint anyone. Get ready to make the next one. Keep me posted as the seasons change! What do you want to cook and when?